This delicious and flavorful chili is made with carne picada and is made in the Instant Pot. This chili is ready in less than an hour but it tastes as if it has been simmering for hours on the stove. I always make my seasonings from scratch when making chili. There are no additives and you know exactly what you’re putting in your food! My seasoning mix is made with chili powder, cumin, onion and garlic powders, paprika, and cayenne pepper to add a little heat. You can adjust the seasonings as you see fit, this recipe makes a milder chili than spicy. You can always increase the heat with some diced jalapenos if you want! When making a meal in the Instant Pot and you’re expecting big flavor, it’s important to increase the seasonings more than you would on the stovetop. When cooking meat, it’s also important to allow the Instant Pot to naturally release. This prevents the meat from drying out and it helps keep the flavors in the food leaving the pot along with the steam when doing a quick release. Carne Picada is usually made with minced chuck roast. I like this version because of the meatier bite you get versus using ground beef. I used roughly 2 lbs of carne picada in this chili. Anywhere from 1 pound to 2 pounds would work well with this recipe. Delicious and easy Instant Pot Carne Picada Chili. Add the carne picada, peppers, and onion to Instant Pot and cook until no longer pink. Add all other ingredients into Instant Pot and close lid and vent. After the time is up, allow Instant Pot to pressure release for 15 minutes before doing removing the lid. 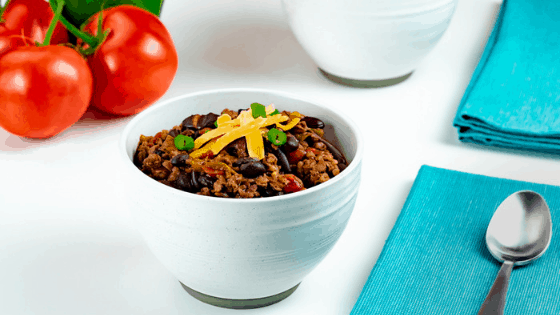 Stir chili and serve with desired toppings.